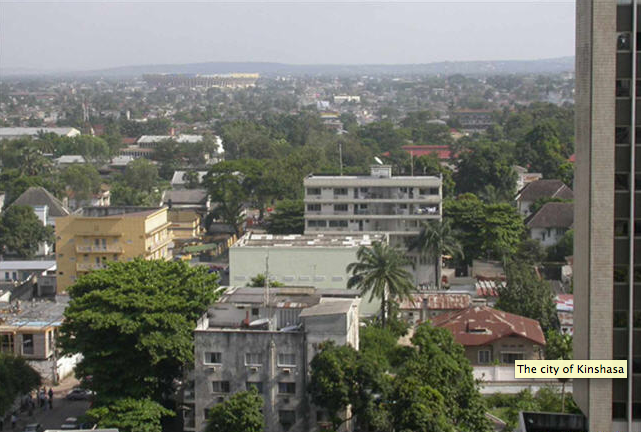 Far from Paris but still in a bastion of Francophony, Kinshasa, the massive capital of the Democratic Republic of Congo, is sometimes called “Kin la Belle,” a nostalgic memory of the Mobutu years in the 1970s. I’ve been brought in by the U.S. Embassy to do social media training with Congolese journalists, and NGO and government people. But I’m still not quite sure how the city works, really, as it sprawls vastly over 10 million inhabitants’ worth of low-slung houses, cars, and street frenzy–and, per US Embassy mandate for our safety, I commute in a white SUV with diplomatic plates between hotel and Embassy, both within the leafy enclave called Gombe (like Neuilly in Paris, or Scarsdale in NY). Excitement is skirting the presidential guard road block (fatigues, red berets, guns, the smell of pot) in the evening in order to take the beautiful river walk along the Congo River. 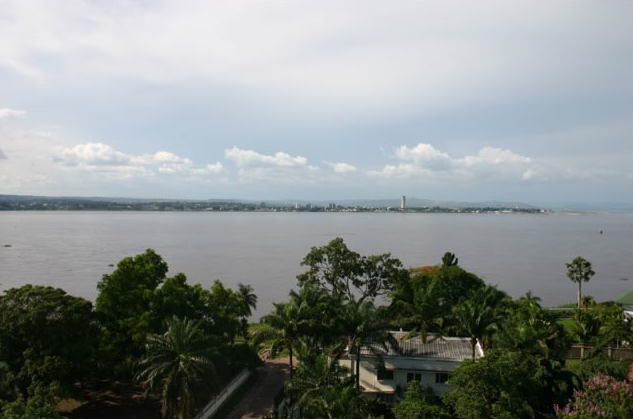 View of Brazzaville from Kinshasa riverfront. In my training today I had two MPs, Gaston and Claudel by their first names, from the majority and an opposition party, respectively, who kept the gallery entertained. Pro-Kabila harangues on the one hand (if the people vote in a referendum to change the constitution to allow Kabila a shot at a third term, then it will have been the people’s will) and on the other hand a surrealistic vision for uplifting the Congo (technology, connectivity, and distributing free cell phones to constituents). Meanwhile, the Congo has, by some counts, over 80% unemployment (there are no official stats), a grandiose river with enough hydraulic energy to power all of central Africa, and yet power outages everyday in Kinshasa. The rest of the class loved that the Honorables went at it, but I eventually had to restrict politics talk to the lunch break as they all began to throw in their own stories of government failure. When Monsieur Gaston, the majority MP who is personally close to Kabila, would start praising the work of the good president, they would all just smile and actually laugh at him outright. Because what else do you do in the Congo? That seems to be the attitude, generally. The U.S. Embassy’s security briefing at the start of my stay had warned about high rates of violence and criminality in Kinshasa. Not so much about warm handshakes and mutual aid, but I suspect one doesn’t by any means exclude the other here. I was told that on the road that we took in the cab on our way back from Bandal, which is the only road, when cars drive by the big Kokolo military base, chances are that a soldiers’ road block will have popped up, and can pose a serious problem for drivers with no cash to hand over. Maybe we just got lucky, but we didn’t hit a road block, and Axel and Jeannot dropped me off at my hotel, a brand new Chinese-built luxury tower with colorful neon lights flashing all the way up the 22 floors of the facade. Not surprisingly, in this gleaming hotel in Gombe full of foreigners, I haven’t experienced any of Kinshasa’s power outages at all.